Of course no list of the Harper government's assaults on Canada's society can be considered complete because there's just so many of them. When i started this process some months ago i soon realized this. i'm going to start with the worst of the worst from my perspective. Back in 2012, the Harper government launched an unprecedented assault on Canada’s environmental laws when it introduced Bill C-38, an omnibus bill that put a halt to automatic environmental assessments of projects under the federal government’s purview. All told, the Fisheries Act, Navigable Waters Protection Act and Canadian Environmental Assessment Act were either repealed or simply gutted, while the NEB was neutered. The Harper government made a wholesale effort to not only destroy protection but then to destroy data and destroy knowledge when eviscerating of the Navigable Waters Act, attempting to close the Experimental Lakes Area, and dumping books from the Department of Fisheries and Oceans Library. All of this, including the auditing of environmental and civil society groups, was done to allow the fossil fuel industry, Harper's #1 benefactor, to build pipelines without having to endure the inconvience of people and laws that oppose such destruction of our common environment. This past year Harper passed Bill C-51, the government’s anti-terrorism legislation - popularly known as the secret Police Act -which criminalizes free speech and allows government agencies to widely share personal information without any regard to privacy, while giving CSIS, RCMP and CSEC freer range to spy on whomever they choose. Consequently, spying on environmental and aboriginal activists, especially those opposed to pipelines or who participate in National Energy Board (NEB) hearings. 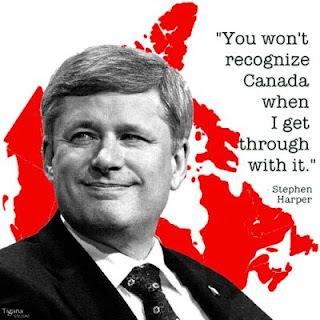 Harper is the only Canadian prime minister to be found in contempt of Parliament, which occurred in 2011 after his government refused to release costs on certain programs to opposition MPs. On the childcare front, Harper scrapped plans for a national daycare program that Paul Martin had promised and now is passing out cheques to all parents, including the rich, to buy votes. Starting in 2010, Harper tabled a bill with 883 pages that included changes to Canada Post and environmental assessments. Since then, Harper has passed 10 more omnibus bills to circumvent debate in parliament, often making sweeping changes to laws and regulations. Haper's attempt at vote suppression - the Fair Elections Act. Last year the Harper government overhauled Canada’s election laws to deal with electoral fraud. But its critics soon labeled it the “Unfair Elections Act” because it weakened the power of Elections Canada, effectively muzzling the chief electoral officer from communicating with the public and MPs about investigations, and cut off the agency’s investigations arm, it changed the ID requirements for voting making it far more difficult for students, FNs and the homeless [all Harper opponnts] to vote. Harper's gagging scientists from speaking freely about their research. Numerous scientists have been prevented from speaking to the media, especially those researching the environment. Germanwatch and Climate Action Network Europe — which produce an annual report card on climate change performance — put Canada 58th out of 61 countries in regards to its efforts to combat global warming, above only Saudi Arabia, Kazakhstan and Australia. Taxpayer-funded political ads. This spring, Finance Canada is planning to spend $13.5-million on ads to boast about the government’s budget. The Toronto Star estimates that $500-million has been spent by the Harper government since 2009 promoting its programs – $75-million in 2014 alone. Certainly there's many more in our past but no more after October 19th - Heave Steve Day.